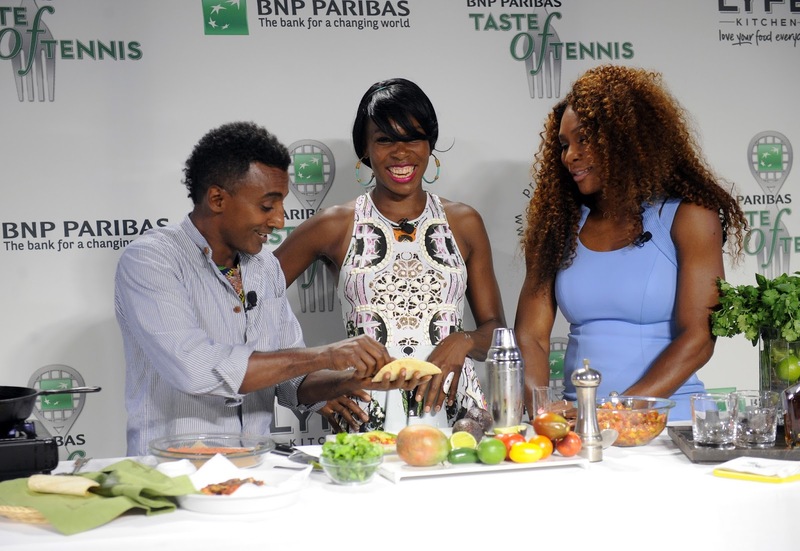 Marcus Samuelsson shows the Williams Sisters, Venus and Serena, a thing or two about tacos. Photo by Getty Images for PNB Paribas. HEAD'S UP: Welcome to the tennis edition of Week In Images. In the week leading up to the U.S. Open, tennis owns New York. Just about everywhere a body turns, there's a tennis star. Some out and about this year: Roger Federer, Serena Williams, Agnieszka Radwanska, Jelena Jankovic,Venus Williams, Victoria Azarenka, Janko Tipsarevic, Sloane Stephens, John Isner, the retiring James Blake and more. 22 Aug 2013/NEW YORK – ONE of the biggest and most enjoyable of the pre-U.S. Open tennis parties is the Taste of Tennis. Fittingly, the 14th PNB Paribas Taste of Tennis did not disappoint. How could it, with top chefs and top tennis players?! And a good cause. The corn chowder was made by special hands. Photo by Getty Images for PNB Paribas. Perhaps, the biggest surprise aside from Serena Williams co-hosting the event with Red Rooster owner Marcus Samuelsson is that during the duo's cooking demo, Venus Williams walked up as casually as you please. A hush overtook the crowd before applause went up.The trio managed to put together a fish taco for SW and a vegan taco for VW. With the addition of mango, it had to be orgasmic. Jelena Jankovic and John Mitchell were doubles partners in the cause of a singular corn chowder. Photo by Maxine Danowitz. Elsewhere, Jelena Jankovic, who's more beautiful than TV gives her credit for, helped chef John Mitchell from LYFE Kitchen produce corn chowder. Yum! 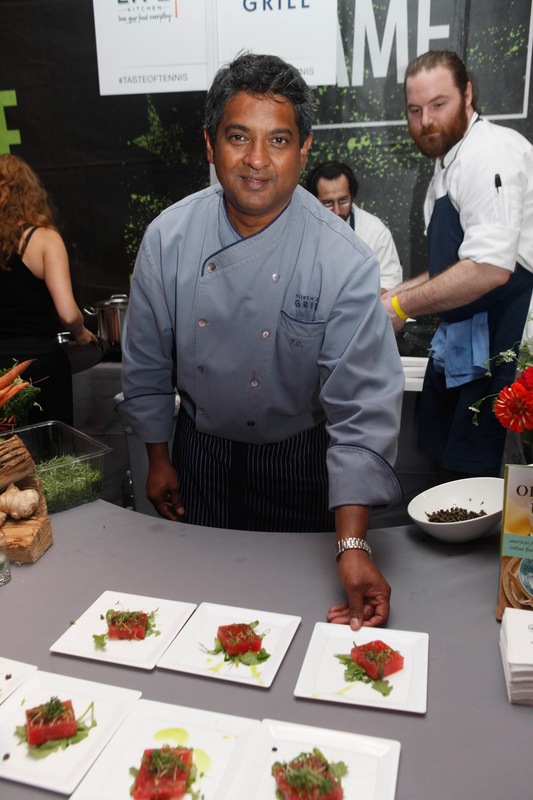 For those worried about GMO's, it was organic, chef disclosed, and vegan. JJ likes corn but said her favorite food is just about everything. When pressed, though, she admitted "anything with chocolate." Janko Tipsarevic is mixing vodka but has wine on his mind. Photo by Maxine Danowitz. Over at the spirits table, Janko Tipsarevic, was mixing Russian Standard Vodka cocktails. Noticing that a certain person was drinking rose, he inquired about it. Informed that the medium-bodied refreshing drink was from Hungary, he indicated his interest in a glass. Alas, when messenger returned with his vino JT had quit the joint with his pals. A fixture at the Taste of Tennis, Brad Gilbert was pushing pulled pork sliders from John Stage Dinosaur Bar-B-Que and kickin' it in Converse All-Stars sans strings. As always, the prognosticator was game to call the winners of the U.S. Open singles final: Serena on the women's side. And on the men's side: "The big three." (Novak Djokovic, Rafael Nadal and Andy Murray, not Roger Federer who is ranked an uncharacteristic No. 7 this year.) That gives BG plenty of wiggle room, no? Floyd Cardoz presents watermelon that looks like anything but. Photo by Getty Images for PNB Paribas. It was all in good fun. And as always, proceeds from the Taste of Tennis benefit a charity. This year's recipient is the James Beard Foundation. Meanwhile, one of the most delicious and deliciously deceptive bites of the evening was Chef Floyd Cardoz's (North End Grill) Watermelon Salad with Hearts of Palm, Arugula, Fried Capers, and Mint Oil. With the naked eye, it was difficult to believe that the melon was not tuna. 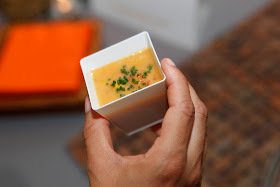 Visit http://www.tasteoftennis.com to learn more about the PNB Paribas Taste of Tennis; visit http://www.jamesbeard.org to learn more about the James Beard Foundation. If Roger Federer implies it, then all who have ears must infer it and act accordingly. Why would he lie? Not because he is the Moët & Chandon Global Brand Ambassador? (See video at top). 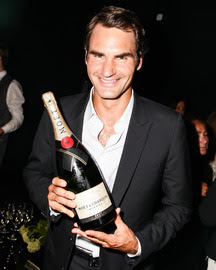 Roger Federer and Moët & Chandon are the picture of success and glamour. Photos by Getty Images for Moët & Chandon. Of course not. One can safely deduce, then, that a glass of Moët & Chandon a day will also keep the doctor away. The tennis great said as much to a high-tone, high-spirited crowd at the venerable bubbly's 270th Anniversary party at Chelsea Piers Tuesday night. No dissent was heard among the partygoers, made up of a usual assortment of beautiful people - models, movie stars, moguls - plus regular folk and RF's galpal Anna Wintour. Word is herself helicoptered in for the grand soiree. 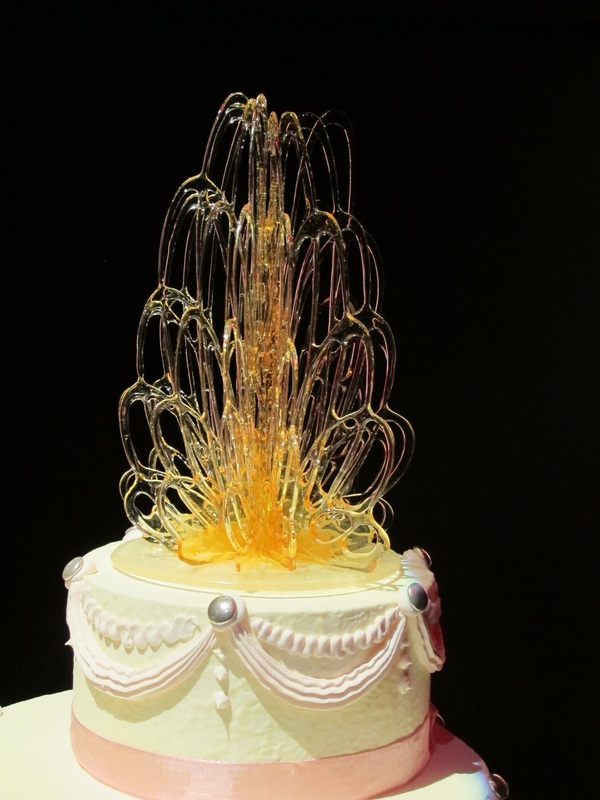 Let them eat the top tier of the Moët & Chandon cake! Photo by Maxine Danowitz. After RF's entrance, speech and grand unveiling of a huge birthday cake and delectable feast, the party went into a higher gear. Commemorative gold goblets were raised to the longevity of the Champagne of "success and glamour since 1743." That's the same year that to modern boxing were introduced some guidelines (Broughton's Rules), adding a civilizing aspect to a heretofore mind-numbing brutal and deadly sport. Surely a reason for a toast with an early bottle of Moët & Chandon, no? As the toast wound down, Emeli Sandé applied vocals to her hit, “Next To Me.” Meanwhile, disc jockey Bob Sinclair kept bodies, including those of Kelly Rutherford and Josh Lucas, burning up the dance floor. Kelly Rutherford stops to greet a friend on the red carpet. As Jeffrey Wright wisely noted in the same breath that he smoothly worked in plugs for his projects, "Boardwalk Empire" and "The Hunger Games": “There is always reason to celebrate with a good bottle of champagne." Carol Alt has a friend nearby in case she needs liquid courage. 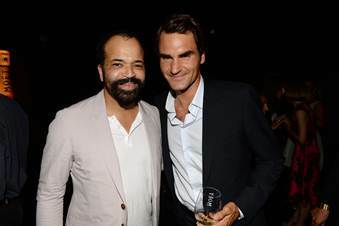 Is Jeffrey Wright getting dish on the perfect slice from Roger Federer? Josh Lucas, amid the crowd, getting himself watered. Visit to http://www.moet.com learn more about Moët & Chandon.